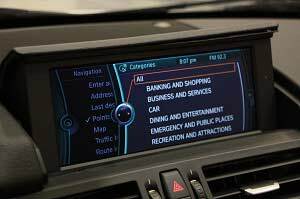 If you have a new BMW with the optional upgrade BMW iDrive MFD Multi Function Display Satellite Navigation System, then you may be aware of some of the problems which car owners across the country are experiencing with these units. They’re pretty cool, look great in the dash but at £2000+ they don’t come cheap! A very common problem that most people are experiencing is complete screen failure which is common across the entire BMW iDrive MFD Multi Function Display Satellite Navigation System range. When they fail, BMW render the entire unit useless and advise that it must be replaced – if it’s replaced under warranty then you’re very lucky but otherwise it seems like a very costly replacement which is where we come in. Before parting with your hard earned cash, there is a very good chance that your existing unit can be repaired saving you a LOT of money. We offer a complete strip down and rebuild of your existing unit in as little as 3 days. Repaired units are returned with our Lifetime warranty and are fully Plug & Play – meaning no programming will be required. All units are first tested on our purpose built testing station which allows us to power the unit up and simulate it as if it was still connected to the vehicle. We can then assess the problem and confirm all underlying faults. We then proceed to carrying out the repairs, replacing any necessary major components including the liquid crystal display (LCD). After repairs the unit is re-assembled and tested again to confirm full functionality before returning the unit to you. There are various different models of the iDrive Multi Function (MFD) Satellite Navigation System and even if you’re driving a different vehicle with similar issues, it’s possible that we can still help you. If you’ve got an issue with your BMW iDrive Multi Function Display (MFD) Satellite Navigation Unit, then before purchasing a new unit give us a call and see how we can help you today. Tags : 6583 9117563-02, 65836974916, 65839138444-01, BMW iDrive Display Not Working, BMW iDrive Faults Repaired, BMW iDrive Repair Specialists, BMW iDrive Screen Not Working, BMW iDrive Screen Problems. BMW 3 series 2014 idrive keeps rebooting every 2-3 minutes. When it reboots the radio and sat nav all work but then appears to loose power and drops out. We’d be happy to take a look at this for you. We test all units first and if faulty, we can remanufacture it and return it with a lifetime warranty for complete peace of mind. My BMW 520d 2007 has an issue with the CCC unit resetting every 10 second. Can you give me a price to fix please. The fault you have described is very common and we have a great success rate in repairing the CCC units from the BMW 5-Series. I have sent you an email with full information and pricing, if you have any questions, please reply to the email and we’ll be happy to assist you. hi I have an issue with my I drive system (2015 116d) its rebooting every 30 sec. please help me with issue, I would like to know the repair cost. That is a very common problem to have and we can definitely test for that fault. There are a number of reasons the unit can fail in this way and once we identify the root cause, we will proceed to remanufacture the unit and return it to you with a lifetime warranty for complete peace of mind. I have sent you an email with full information & pricing. If you have any questions, please respond to the email and we’ll be happy to assist you. IDRIVE FAULT ON DIAGNOSTIC OF A BMW 2 SERIES GRAN TOURER 2015. ARE YOU ABLE TO FIX THESE MODELS? We’ve started to see these units come in and have tested & repaired a few of these now. I have sent you an email with full information and pricing. I have a BMW 530D and IDrive is not working. Screen either blank or BMW on screen but noting else. Can you fix this? It’s a very common problem on the BMW iDrives and we’ve repaired 100s of units with similar faults. Got a Bluetooth issue, telephone screen is hanging just displaying……. Please wait. Had a garage code a different combox but problem remains so appears to be an issue with the head unit. Have really hit a dead end in getting this investigated further. Is this an Issue you’ve come across before? We have seen this type of fault and other similar faults with these units. I have sent you an email with full information and pricing. Can you fix these tyoe of issues and what would the cost be? It’s an extremely common fault to have and one that we are repairing daily with a great success rate. I have sent you an email with full information and pricing. If you have any questions, please reply to the email and we’ll be happy to assist you.